Listen to a podcast by clicking the audio link of Destination East County originally aired on KNSJ. 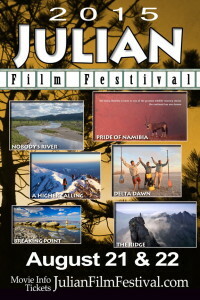 August 20, 2015 (San Diego's East County)--This week’s Destination East County features the Julian Wild & Scenic Film Festival, singers and song writers of the ‘60s, grape stomping at a vineyard, a top comedian's performance and movies in the park. Plus we’ll have a preview of coming attractions including a Native American pow-wow, a Bluegrass Festival in Santee and Descanso’s Deep Pit BBQ. So stay tuned for all of these events and much, much more! Lamplighters Theatre presents “The Supporting Cast” August 22nd from 8-10 p.m.
Meet East County Magazine's editor at the Santee Library Tues. Aug. 25 at 6 p.m. to share your ideas for news stories in Santee/Lakeside or learn how you can volunteer to be trained as a citizen journalist! Help build our Santee/Lakeside community section! Community members and business owners are welcome. This event is free and open to the public, co-hosted by the Santee Solutions Coalition. There will be prizes and surprises, too. Comedian Arsenio hall of late-night TV comedy and movie fame will be performing on Thursday, August 27th at 8p.m. in Sycuan’s Live and Up Close Theater. To reserve tickets, you can visit www.Sycuan.com. The Heritage of the Americas Museum at Cuyamaca College is hosting an opening reception for a fine art show and sale, “Plein Air Paintings of East County,” featuring the work of artist Gloria Chadwick, from 5-7:30 p.m. Friday, Aug. 28, on the museum’s tropical garden patio. The event is a museum fundraiser. The framed, original paintings are priced from $150 to $300, with a third of the proceeds being donated to the museum. The plein air, or “in the air,” paintings were painted by Chadwick on location at various East County sites, including Alpine, , La Mesa, Lakeside, Flinn Springs, El Cajon, Harbison Canyon, Dehesa, Dulzura, Barrett Junction, Jamul, Japatul, La Posta, Mt. Springs Grade, Desert View Tower, Spring Valley, Santee, Casa de Oro, Rancho San Diego, Mt. Laguna, Descanso, Tecate, Lake Moreno, Campo, Cuyamaca, and Pine Valley. Off Broadway Live in Santee presents "The 1960's Singers & Songwriters" on September 4 & 5 at 6:30 p.m.
Take a step back in time to the "supper clubs" of Harlem & Manhattan- the food, the drink, the bands & the music . . . and that's what ENCORE Supper Club is all about, but with a modern twist! Remember the sounds of The Righteous Brothers, Van Morrison, The Beatles, Petula Clark, The Mamas & The Papas, Dusty Springfield, Dionne Warwick, The Grass Roots, Gary Puckett, Frankie Valli & The Four Seasons, Creedence Clearwater Revival, The Guess Who and so many more . . . That's what this night is about! The event includes a fully catered dinner and beverages. The live combo plays great dinner music, then Bob & Steve, with musical guests, singing the songs of the best singers and songwriters of all time. Off Broadway Live is on Cuyamaca Street in Santee – See more at: http://www.OffBroadwayLive.com . The 45th annual Barona Pow-Wow will be held at the Barona reservation’s sports park in Lakeside from Friday, September 4 through Sunday, September 6. A grand procession will take place at 7 p.m. on Friday and Saturday featuring representatives of all tribes participating. There will be competitions all weekend long, as well as craft and vendor booths. 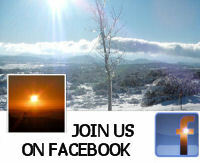 For more information, visit http://www.barona-nsn . Fall is harvest time at East County wineries across East County and on September 5th , the Julian Grape Stomp Fiesta will be held at Menghini Winery from 11 a.m. to 7 p.m. There will be tons of grapes to stomp, plus wine-tasting from local wineries, food and craft vendors and more. For tickets and details, visit www.JulianCA.com. The 78th annual deep pit barbecue in Descanso will be held on Sunday, September 6th, hosted by Our Lady of Light Parish church. The preparation starts the night before, with the slow-cooking of seasoned beef using two cords of oak firewood. The Sunday BBQ and festival takes place starting at 11 a.m. on Sunday, also including live music, crafts, games and vendor booths as well as prize drawings. For all the juicy details, you can visit www.ChurchBarbecue.com. The twang of banjos and fiddles will again fill the air, while delicious food and beverages fill appetites, at the 6th Annual Santee Bluegrass Festival on Sept. 12 from 5:30 t 9:30 p.m. The one-night festival is a fundraiser that benefits local teen programs, park improvement projects and the city’s recreation scholarship program that subsidizes fees for less fortunate children, families and seniors. The event takes place at Town Center Community Park East. This year’s lineup features two talented bluegrass bands, Box Canyon and High Mountain Road. Admission includes wine and beer sampling plus tastes of food prepared by local restaurants. This event usually sells out quickly, so organizers advise music lovers not to fiddle around! Tickets are available at the City of Santee’s website or at Santee’s City Hall. If you have an event you’d like added to our calendar, or if you would like to sponsor the Destination East County column on our website, or the Destination East County show on KNSJ radio, you can contact editor@eastcountymagazine.org Destination East County is the most-read feature on our website!